Lemony Chicken Salad, Green Beans, Thyme for Cooking summer salads. 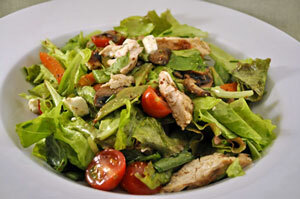 Lemon marinated chicken and a lemony Honey Mustard Vinaigrette, give this salad a fresh, citrus flavor. Use any greens that are in season, but I especially like multi-colored Romaine for this. In small bowl whisk together lemon and olive oil. Pour over chicken and marinate for 15 minutes. Fill a medium saucepan 2/3 full of water and bring to a boil over high heat. Add beans and blanch for 3 minutes. Cut cherry tomatoes in half or slice tomato, then cut slices in half. Take 2 tbs of the marinade from the chicken and heat in a medium nonstick skillet until sizzling. Add mushrooms and quickly stir-fry for 2 minutes. Cook chicken breasts on barbecue grill for 10 - 15 minutes, turning once, or until done. They are done when no longer pink and juices run clear. Stick a skewer or knife in to test. Or you can sauté them in a nonstick skillet for about the same amount of time. Remove chicken and slice. In small bowl whisk together the honey, mustard and lemon juice. Slowly whisk in oil. It will be fairly thick - which means you have to toss well to avoid 'over-dressing'. Toss lettuce with some of the vinaigrette. Arrange mushrooms in the center with chicken slices around the mushrooms, then the green beans, tomatoes, pepper and avocado around the chicken. Sprinkle walnuts, chives and basil over all. Drizzle with a bit of the vinaigrette and serve, with the remaining vinaigrette on the side.